Amsoft's attempt to create their very own mascot saw the emergence of the ever-changing Roland, in which over the course of several games became an expert at space exploration, caves diving and tomb raiding. 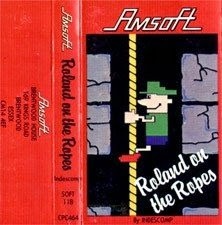 Roland on the Ropes see's him in a more human and appropriate form, dodging the ghosts, rats and spooks to find the treasure and escape the rope laden tomb. With sound instantly recognisable SFX and colourful if a little flickering of the graphics, playing this 1984 adventure is a good laugh. Hard as hell in places, with seemingly endless mazes and tunnels and ropes, and ghosts which true to folklore appear out of the walls in an instant. Squeaky rope amusement ol' rollie-boy! Honourable Mentions - Rampage, R-Type, Rastan.